A pervert who was convicted of sending a schoolgirl a sexual picture on Facebook has been warned it’s “inevitable” he will be jailed. Ian Hay, 26, who has previous convictions of a “sexual nature” was found guilty after a trial at Aberdeen Sheriff Court of sending the girl, who cannot be named for legal reasons, a picture of a male’s private parts. The offence took place at an address in Aberdeen on January 6. Hay had denied the charge against him, but the jury took around 40 minutes to unanimously find him guilty of the offence. 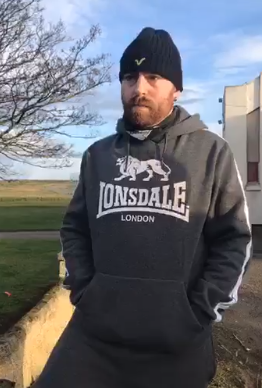 Sheriff Graham Buchanan told Hay, a prisoner at HMP Grampian, that he would be remanded in custody until sentencing so a background report could be compiled. For each of these charges a bail aggravation was libelled. All of the charges involved girls aged between 14 and 16, none of whom knew the appellant. On the date libelled in charge (1) complainer A was delivering newspapers. The appellant drove slowly past and looked at her. Then he drove slowly in front of her as she made her deliveries. He stared and nodded at her. The witness sent a text message to her mother telling her that she was scared because she thought that she was being followed. She asked her mother to meet her. When her mother arrived the appellant drove off. The complainer was visibly shaken. On a date within the period libelled in charge (2) complainers B and C were walking in the street when the appellant drove past. He repeatedly waved and gestured at them to come over. He stopped his car further down the road and then drove after them. Both girls were frightened and ran into the grounds of a nearby school. On a date within the period libelled in charge (3) complainer D was standing alone at a bus stop when the appellant approached her. He nodded and stared at her as he passed. This happened on four further occasions. Later, when he was in his car the appellant stared at her, gestured that she should come over and nodded as he drove past. She was by now afraid of the appellant and was unsure of his intentions. She told her mother. The police were contacted. Later, she was accompanied to the bus stop by her grandfather, who saw the appellant’s car and noted the registration number. The appellant was interviewed by police in relation to charges (1) and (3). He denied all knowledge of the incidents. After his appearance in court he was released on bail. On a date within the period libelled in charge (4) complainer E was standing at a bus stop when the appellant repeatedly drove past and stared at her. He stopped his car just past the bus stop and looked at her for about 5 minutes. On the evening of 16 March the complainer in this charge was with her friend complainer C when the appellant drove past and stared at them in his mirror. On the date libelled in charge (5) complainer A was standing at a bus stop when the appellant drove past and nodded at her. He then drove past in the opposite direction before stopping about ten metres away. On the date libelled in charge (6) the appellant drove slowly past complainers F and C and stared at them. On several occasions throughout the following day he drove slowly past complainer F and stared at her. On two occasions on the following day he drove past her and stared at her. He then stood outside his car and waved to her to come over. On the date libelled in charge (7) complainer C was walking to school when the appellant drove past and stared at her. She was upset and went to the police.